at hem. Charcoal/Red, Charcoal/Neon Lime, Charcoal, Fluoro Orange, Charcoal/Blue. Notice the modern appearance of the collar and cuffs and the fashionable fit. 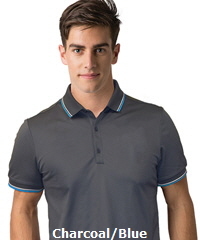 Great polo ready for your logo! Coolplay mini birdseye mesh fabric with tipped collar and cuffs, side splits at hem. Charcoal/Red, Charcoal/Neon Lime, Charcoal, Fluoro Orange, Charcoal/Blue. Notice the modern appearance of the collar and cuffs. Order 20 shirts with embroidery service. Shirt colours and sizes can be mixed within your order. Initial Program Set Up is $90.00 + 10% GST includes a sample of your logo.